Working closely with Carter, Landmark created an impressive inflatable display, complete with giant logo and signage. At 20 feet high x 30 feet wide, the spacious structure can house several sizable vehicles. 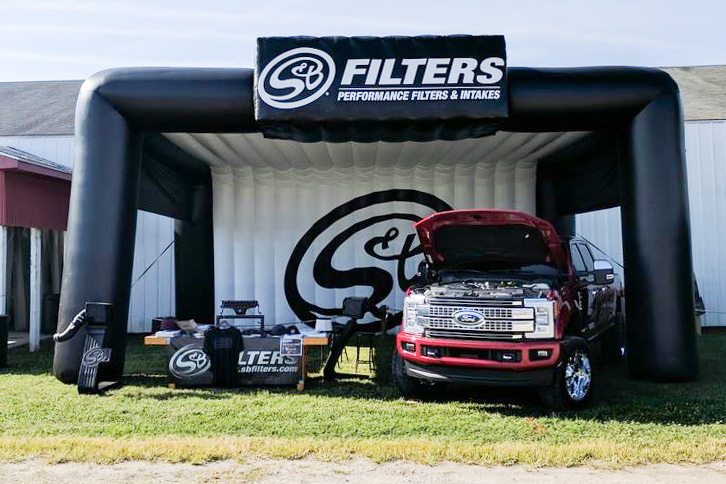 This enables S & B to showcase its products – cold air intakes, performance filters, and particle separators for trucks and SUVs. According to Carter, "Landmark Creations has the best product at the best possible price." But what really sold him was the company's "first-rate" team. "Landmark was able to produce the inflatable on extremely short notice," he says, "then overnighted it to our destination to make sure we had it on time!" So far, the huge inflatable tent has paid off for S & B. Says Carter, "it has allowed us to attend more events than we ever could before." What's more, he reports, "The interest in our brand and products has increased by having the inflatable. In my opinion, it has an even bigger effect at events than we would have with a semi."